Preheat the oven to 350˚ F. Line two cookie sheets with parchment paper. Using a stand or hand mixer, in a large bowl on medium speed cream the butter and sugar together until the sugar has dissolved into the butter and the mixture is light and fluffy. Add a large egg and mix until combined. Add the molasses and mix well. In a separate bowl, whisk together the flour, ginger, baking soda, cinnamon, cardamom, and salt. With the mixer on low, add the dry ingredients to the creamed butter mixture a little at a time until a dough forms. Refrigerate for three hours or overnight. On a lightly floured surface, roll out the dough to about 1/8” thick and cut out cookies with cookie cutters. Transfer to the prepared cookie sheets, place in the oven and bake for 10 minutes or until golden brown. Makes 36 cookies. 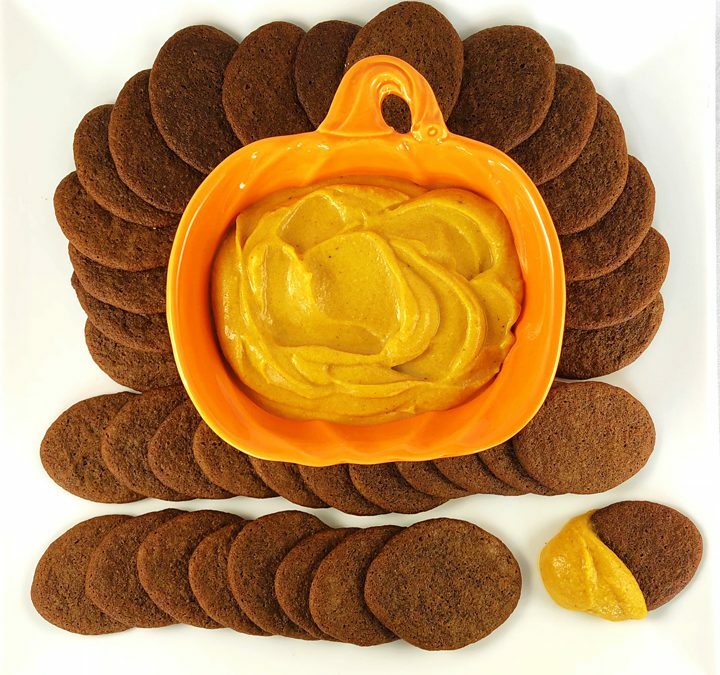 In a food processor combine the pumpkin puree, light brown sugar, cream cheese, ginger, cinnamon, all spice, nutmeg, cloves, and salt; process until very smooth. Add the heavy cream, vanilla, and xanthan and continue to process until very thick. Transfer to a dip bowl and keep refrigerated until ready to serve. Serve with the ginger cookies.